1. If I pick up my rental from the shop, can it be picked up by Barefoot at my location later? - No, unless pre-approved/ pre-arranged with Barefoot staff. 2. If my rental is delivered can I drop it off at the shop myself? - This is on a case by case basis due to transporation limitations. Please let us know ahead of time. 3. Will you relocate my rental if I want to explore multiple locations? - No, we deliver to one location per rental. We are happy to go to a different delivery location with your next rental, whether that is the next day or the second half of the day.These rentals cannot be combined for one price unless pre-approved. 1. If my bicycle gets a flat, can I fix it myself? What should I do? -Call us! We will bring you a new bike immediately. Repairs are only made by Barefoot. 1. If I have a 1 day rental but want to keep it longer, can I do so? -Yes, we allow rental extensions for any rental duration, please call and extend BEFORE your rental is due to be returned. 2. If I extend my rental, do I need to pay right then? 3. Does Barefoot provide safety equipment? -Depending which item you rent, we always provide helmets, life vests, and leashes with every rental. 4. Can I use my rental equipment at night? -No. 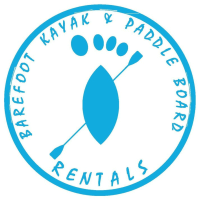 Barefoot does not provide night gear, such as lighting, for our rentals.